It's the first time we've caught wind of LG's P-Series, but it appears the founding father of the new range will be a high-tech Android-based device. 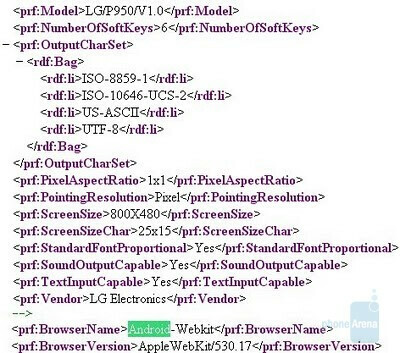 An XML file has surfaced on the Web and reveals the existence of a mysterious handset, named the P950, that no one seems to know much about. Broadly speaking, the useful information about the handset includes two major facts - the cell phone will be equipped with WVGA display and Android WebKit browser. All other details available in the XML file and standard – supported multimedia formats, installed language packs etc. We guess we will have to wait a bit longer until we find out more about the device, but we suppose it will be a high-end phone, since only the highest-ranking droids today support such a high screen resolution. The LG P950 is probably intended for the European and US markets, since most devices hitting the shelves across Korea have special designation, usually SU/LU followed by four digits. We hope we get to see more details about the mysterious cell phone trickle on the Internet soon. Its just better be capacitive, I talk to a Guy at an LG Booth and he said he wasn't sure when LG was going to jump on that wagon...that was end of 09 so hopefully they've been in the works.